Conventional lead-based pacing has developed over 60 years, but is associated with complications related to the generator and leads. Leadless pacing has evolved over the last four years, with the evidence base demonstrating reason to be optimistic, with comparable or low complication rates. Since the first implantation of a pacemaker 60 years ago, the medical world has seen an incredible evolution of these devices. The first pacemaker had limited capability. With time, we have seen changes to lead design that have meant that they are smaller, more robust and last longer. The greatest changes have occurred with the electrical aspects of the devices. There are enhanced algorithms in the devices that make them more physiological, and magnetic resonance imaging (MRI) safe devices are now considered the standard of care. This journey has not been without some challenges, and this therapy continues to be troubled by complications associated with the generator that houses the electrical components and the pacemaker leads. These complications include device infection, vascular access complications, vascular occlusion, cardiac perforation/tamponade and lead displacement.1 The incidence of these complications varies in the medical literature, but remains consistent at a level that might be considered suboptimal. To date, two broadly different concepts of leadless pacemakers have been reported. The first involves a small device that contains all of the components of the pacemaker that is deployed in the right ventricle and delivered by a catheter from the femoral veins. The second is a leadless device that fixes into the endocardium of the left ventricle and communicates to a device on the chest wall by ultrasound. This latter device is leadless but requires a conventional lead-based device (pacemaker or implantable cardioverter defibrillator) that it triggers off to provide biventricular pacing. This article will focus on the former technology and summarise the salient features of the latter. Both the Nanostim and Micra devices are implanted by the femoral veins (usually the right) and can be performed under local anaesthetic (figures 1 and 2). A large bore introducer sheath (up to 23F) is used to provide access for the delivery catheter.5 This is then placed under fluoroscopic guidance in the right atrium. The catheter can then be flexed across the tricuspid valve into the right ventricle. The target deployment location is usually the right ventricular septum. This can be accurately located using varied fluoroscopic angles and the injection of contrast. Once the device is positioned it can then be deployed. In the case of the Nanostim device this has a helix on the end of the device that can be ‘screwed’ into the endocardium in a similar manner to conventional active fixation leads (figure 3). The Micra device has four nitinol tines on it that are unsheathed at the time of deployment, with them fixing into the endocardium (figure 4). The Micra device requires a minimum of two tines to be fixed to the endocardium to provide a tensile strength of fixation greater than conventional active fixation leads. Once in place, the devices are checked for stability of fixation and electrical parameters. These parameters are similar to conventional pacing in that R-wave amplitude, impedance and pacing threshold are assessed. Once it is confirmed that these are all satisfactory the leadless pacemaker can be released, via a tether, and the deployment catheter and introducer sheath removed. With any new device or procedure, safety and efficacy are a key feature of their introduction into clinical practice. There has been extensive reporting of both devices in the medical literature. As the Nanostim device was the first to be implanted, a small series of 33 patients was reported showing a freedom from complication rate of 94% (31/35).3 In one patient there was a cardiac perforation that required surgical repair, but unfortunately the patient died 18 days later from a cerebrovascular event. In one patient the device was inadvertently deployed in the left ventricle via a patent foramen ovale. This was then successfully retrieved and redeployed in the right ventricle. The electrical characteristics at implant and follow-up to 12 weeks were excellent. Subsequently, a series of 526 Nanostim devices was presented.6 The device was successfully deployed in 95.8% of attempts with a serious adverse event rate of 6.8% at six months. These adverse events included cardiac perforation (1.6%), vascular access complications (1.2%), arrhythmias during implantation (0.8%), device dislodgement (1.5%) and elevated threshold at follow-up (0.8%). 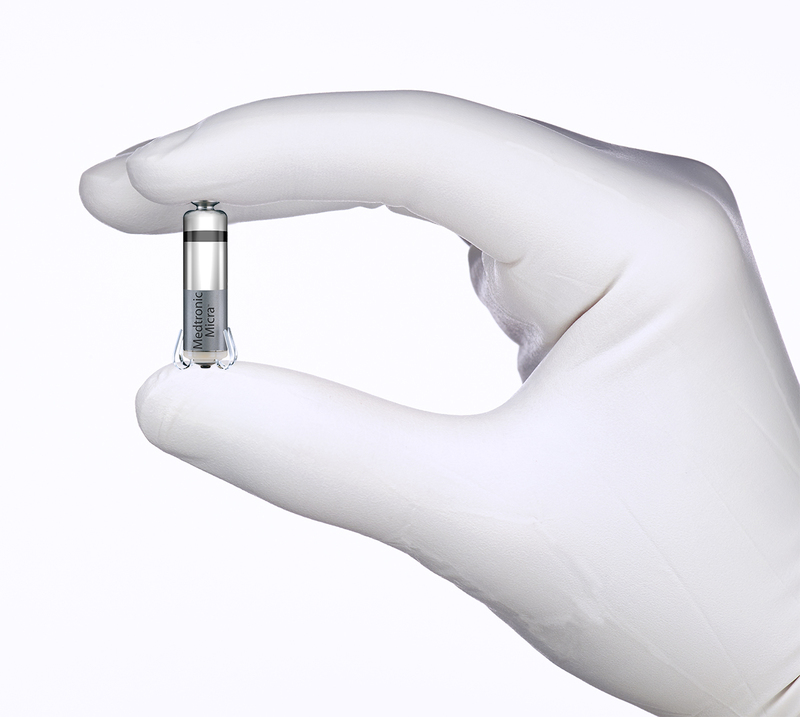 After 1,423 implants of the device worldwide, manufacture of this device was temporarily halted due to concerns over premature battery depletion. It is anticipated that implantation of a redesigned version of this device will commence in the near future. The experience of the first 725 Micra devices was reported in 2015.4 This demonstrated a successful implantation in 99.2% of cases and a major complication rate of 4.0% at six months. In this study, Micra implantation was compared with a historical cohort of 2,667 patients that had been implanted with a conventional pacemaker. Complications of the Micra device included cardiac perforation/effusion (1.6%), vascular access complications (1.0%) and elevated pacing threshold at follow-up (0.3%). When compared with the historical control, the Micra group was found to be older and have more comorbidities, but had a significantly lower rate of major complication compared with the control group (4.0% vs. 7.4%; hazard ratio 0.49%; 95% confidence interval [CI] 0.33 to 0.75; p=0.001). Electrical characteristics at 12 months were considered normal and consistent. The initial concern regarding the rate of perforation associated with leadless pacing has been studied in detail. A meta-analysis compared the two initial studies of the Nanostim device and Micra device with published data on more than 60,000 conventional pacemaker implantations.8 The authors of this study concluded that the rate of perforation of leadless pacemakers was slightly higher than with conventional pacemakers. The publication of the Micra Registry data brings this perforation rate in line with conventional pacemakers. Safety data on all three leadless pacing systems are summarised in table 1. An important aspect of leadless pacemakers to highlight is the notable low rate of device infections, with none reported in the Micra study, Micra Registry study or the Nanostim Leadless and Leadless II studies.3,4,6,7 This offers a significant benefit over conventional pacing where device infection is associated with significant morbidity and mortality. The mechanism of this is possibly related to device encapsulation within the right ventricle and, essentially, isolation from the general circulation. Furthermore, the lack of a surgical pocket related to the generator is likely to be an advantage in reducing infection rates. The Wise CRT System (EBR Systems) uses a novel technology to stimulate the left ventricle. A small device is implanted in the left ventricle using a catheter either retrogradely via the aortic valve or transseptally from the femoral vein, across the inter-atrial septum and through the mitral valve. A generator is implanted on the left chest wall that is connected to a small ultrasound source that delivers an ultrasound pulse to the leadless device in the left ventricle. This transduces the ultrasound energy to an electrical impulse that can then stimulate the left ventricle. This system is designed to trigger off a conventional pacemaker or defibrillator and provide biventricular pacing (figures 5 and 6). Data on this system are currently limited and confined to two small feasibility studies of 89 patients. In the first 35 patients, the device was successfully deployed in 97% of patients. This study showed a relatively high rate of complications, including bleeding/haematoma (11.4%), stroke (2.9%), pocket infection (5.7%) and migration of the transmitter or battery (2.9%).9 It is important to take this complication rate in context, as this technology is indicated for a very different population than other forms of leadless pacing. These patients are indicated for biventricular pacing and so, by definition, are a sicker cohort. The Micra and Nanostim devices are fully functional VVIR (demand ventricular pacing with physiologic response to exercise) pacemakers. This means that they are single-chamber ventricular devices that have a rate-response facility. They are interrogated using a conventional pacemaker programmer. They have autocapture facilities and are fully programmable, though not able to store electrograms of arrhythmia events. The Micra device is compatible with the Carelink remote follow-up system that allows transmission of pacemaker data from the patients’ home to a secure server, where their medical team can review their data. Any patient who has an indication for a VVIR pacemaker may be suitable for a leadless pacemaker. However, with new technology there is usually an associated increased resource demand, and so these devices are likely to incur significant costs above and beyond conventional VVIR pacemakers. In the majority of health environments, unless there is an associated appropriate reimbursement tariff, leadless pacemakers are likely to be confined to specific patient populations. There are a number of groups of patients that leadless pacing may be particularly attractive for use. Individuals who have limited vascular access for conventional pacing are the most obvious. This might include patients with previous lead-based systems where the venous system is occluded, those with surgically corrected congenital heart disease, or patients on haemodialysis where vascular access is at a premium, and there may be a high rate of infection. In these patients, an alternative option might be epicardial pacing and so leadless pacing offers a better option than this. The low rate of infection with leadless right ventricular pacing may also offer an attractive option for those patients that have had conventional device-related infections requiring device extraction. There is an increasing experience of the use of leadless pacing in these patients, either at the same sitting as the extraction, or a few days later. This offers benefit in early discharge from hospital, where the usual practice would be several weeks in hospital with intravenous antibiotic treatment prior to reimplantation on the contralateral side. Some young patients with infrequent demand for pacing may also be suitable for single-chamber leadless pacing, where conventional dual-chamber pacing might usually be selected. The use of pacing in cardio-inhibitory vasovagal syncope is controversial, though in some cases it might offer clinical benefit. Committing a young patient to long-term pacing therapy with leads in the vasculature is not without significant risk later in life. Therefore, those patients with prolonged pauses associated with vasovagal syncope might benefit from leadless pacing. Battery longevities as high as 15 years might mean that at the time of battery depletion individuals may no longer be requiring pacing therapy. Finally, there are some patient groups where the absence of a device generator on the chest wall may offer significant benefit and offset the potential benefit of dual-chamber over single-chamber pacing. These include individuals with certain contact sporting activities or occupations, e.g. armed forces or police service. Some individuals have significant psychological and cosmetic concerns regarding the visibility of the conventional generator and so leadless pacing may address these issues. Leadless pacing is in its infancy, though it is possible that this may represent the standard of care in the future. 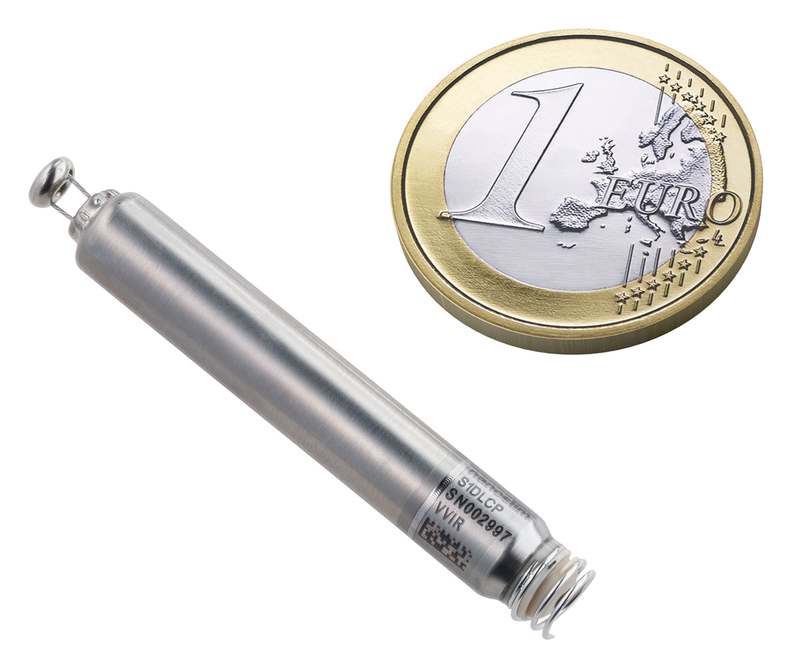 It is anticipated that a leadless pacemaker for the right atrium will be available in the very near future. This would provide the opportunity for AAI (atrial pacing and sensing) pacing, but, importantly, if able to communicate with a ventricular leadless pacemaker, provide complete leadless dual-chamber pacing. The Wise CRT system has demonstrated the feasibility of left ventricular pacing, and so it is a natural development that after dual-chamber pacing, biventricular pacing would be next. It is possible that an interim solution to a fully functional dual-chamber leadless system might be a ventricular device that senses atrial activity and triggers ventricular pacing, maintaining atrioventricular (AV) synchrony with a single-chamber device (VDD mode). Leadless pacemakers have allowed for leads to be removed from the vasculature. This has been perceived to offer clinical benefit in the same way that subcutaneous implantable defibrillators (S-ICD) have removed the requirement for defibrillator leads in the vasculature. The major shortfall of S-ICDs is the inability to deliver adequate bradycardia pacing and anti-tachycardia pacing (ATP). S-ICDs have been implanted with leadless pacemakers, where the two devices operate independently, with the pacemaker delivering bradycardia pacing. The natural evolution is to have both devices in full communication with the leadless pacemaker able to pace and ATP. Current electrical performance of the Micra device suggests battery longevities may be as long as 13 years, depending on demand. Clearly, it is early in our experience of these devices, and the true longevity will only be known with the course of time. An important question is what happens when the battery reaches the end of its life? The Micra device can be programmed off and cadaver studies have shown that up to three devices can be placed in the average human heart without mechanical interaction.10 Most devices are likely to fully encapsulate within 12 months and so extraction of depleted devices will probably require custom designed tools. In time, battery technology may allow for greater longevity. Alternatively, there may be rechargeable options or energy harvesting capability using cardiac kinetic energy to maintain battery life. At end of life, leadless pacemakers have been demonstrated to be safely cremated without the need to extract them. There have been no environmental issues with cremation or damage to crematorium equipment. Leadless pacing is an exciting evolution of cardiac pacing at the 60th anniversary of the first implanted cardiac pacemaker. While we are still early in the journey of leadless pacemakers, there is great reason to be optimistic that leadless pacing might be the standard of care for the future. PRR has received fees from Medtronic for consultancy and education.